On January 25, 2004, Mars was invaded. Again. That was the date the Opportunity rover landed in Meridiani Planum, a flattish plains area near the Martian equator. This being only the third American rover to touch down on Mars, engineers chose a relatively boring spot for it. Landing on a hill or in a field of sharp pointy rocks could damage the rover, so they opted for safety first. Well, as safe as they could make it given its Wile E. Coyote landing. The rover was attached to a lander, with a heat shield on one side and a folded up parachute attached to it via a backshell on the other side. First it rammed through the thin Martian atmosphere to slow itself down, then ejected the heat shield. The parachute was deployed to slow it more, then, once it was low enough — get this — airbags surrounding the rover and lander assembly were inflated. Then the whole thing detached from the parachute and backshell and rolled across the surface of Mars. Then, finally, one more ridiculously cool thing happened: By sheer coincidence, the lander fun ball happened to come to rest inside a small (~20 meter) impact crater! 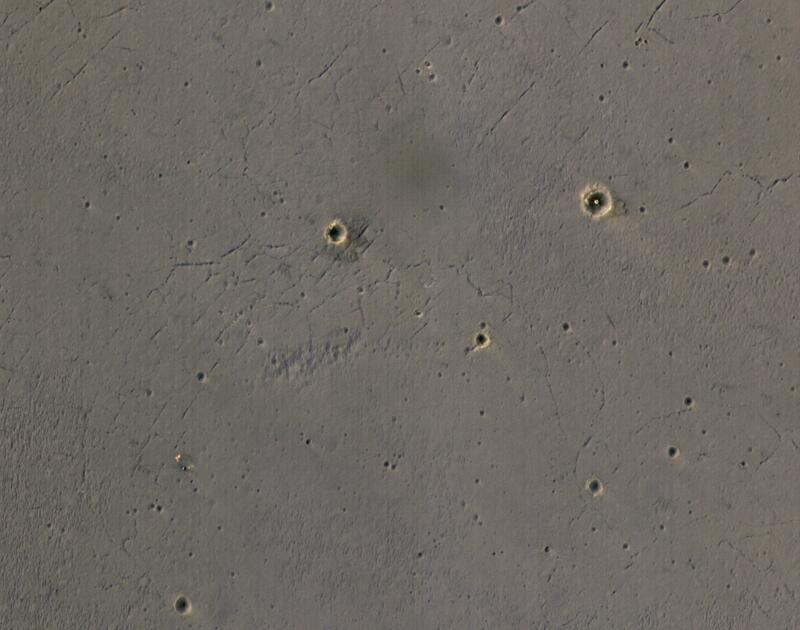 And now, you can see for yourself just how cool that was, because the HiRISE camera onboard the Mars Reconnaissance Orbiter got a fantastic shot of the landing site! Whoa. This shot was taken on April 8, 2017, when MRO was high above Meridiani Planum. In this annotated shot (you can grab the unmarked version as well), you can see the crater in the upper right, with the lander in the center. To the lower left the backshell and parachute are clearly visible as well. The lander, itself, is pretty amazing, too. It has a triangular base with a triangular petal on each side. When it came to rest, the petals unfolded. This is very clever: Even if it landed with a petal on the ground instead of the base, the opening of the petals would tip the lander over onto the base. Oh, yeah. Mars. You can see the lander and deflated airbags on the crater floor, the rover’s tracks, and lots of interesting rocks, gravel, sand, and dust. In fact, this was all very interesting: All this evidence points toward this area having once been underwater, and for a long time. The ground was covered with small spherules, nicknamed blueberries, which had hematite in them. That mineral, on Earth, usually forms in water, and later, jarosite was also detected in that area, which only forms in (acidic) water. Ancient standing water on Mars was confirmed, and Opportunity landed right in the middle of it! That was no coincidence, though; planetary scientists picked Meridiani Planum because even, from orbit, it very much looked like it was the site of an ancient lake. That suspicion was confirmed by Opportunity. The rover made a fantastic scientific discovery right out of the gate. And it gets better: today, 4841 Earth days later, it’s still roaming the Martian surface, poking around and mapping the surface. Mind you, Opportunity’s initial primary mission was only for 92 days! It’s lasted 50 times the manufacturer’s warranty. That’s some solid engineering. Spirit, Opportunity’s twin that landed a few weeks earlier on Mars, got stuck in the sand in 2009, and NASA declared the end of the mission in 2010. That was sad, but still an extraordinary achievement. I love stuff like this. It’s amazing to me that we can do any of this at all, but also that we have enough assets on and around Mars to be able to get actual images of it (And if you want to have some fun, try to find the landing site in this wide-field context image; it may take you a few minutes)! We’re just getting started here. In the coming decades, this will be remembered as a time of beginnings, and I’d wager, some day, the Opportunity landing site will become a tourist destination. I envy those visitors. But perhaps, too, they will envy us. We got to watch this when it happened.